At a press conference in Paris on Friday afternoon activists unveiled how they would mobilize people in France to have a say despite the state of emergency that prohibts mass protests. 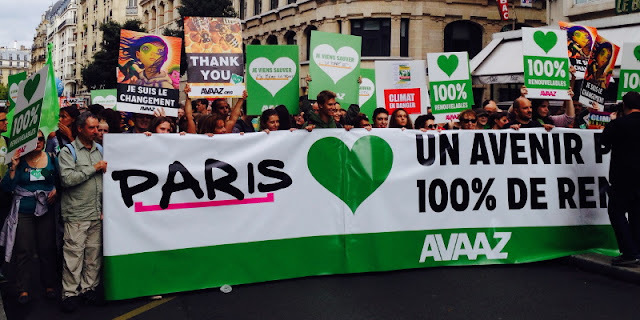 The Climate 21 coalition, a coalition of 130 groups involving unions, environment, community and climate activist associations, are adamant that the protests scheduled on November 29 and December 12 should proceed in some form taking into account the altered security requirements and sensitivity to the Paris attacks victims and their families. "We will not renounce our mobilization, but we thought about other ways to occupy public space," said Juliette Rousseau, spokesperson for the Coalition according to a le Monde report (fr). In referring to the victims of terrorism in Paris on November 13, she said, "It is now more necessary than ever to fight for a world of peace, against climate change which is clearly now a worsening threat". At the press conference Juliette Rousseau highlighted the irony of football games and the Christmas market on the Champs-Elysées proceeding while climate mobilisations are banned. Mobilisations #climat annulées vs marchés de Noël maintenus. Quid du danger pr foules de consommateurs? Mesures sécuritaires ou politiques? So, the Climat 21 Coalition proposed three mechanisms to circumvent the prohibition under the state of emergency, but still allow a measure of free expression on the climate issue asociated with the holding of the United Nations Climate Conference COP21. Firstly, visual and audible art installations will be placed to trace the route of the march on November 29. These will include shoes symbolizing walkers placed along the route. These creative installations will detail the principle messages: "remember the urgency of the climate crisis but also show our solidarity with the people who are at the forefront of the crisis and change; the link between climate, employment and social justice; existing solutions; officials who benefit from climate crime, the need to protect nature to protect the climate, and finally the citizens calling for mass action - from religious groups to youth, and grandparents for the climate." Secondly, to display a common symbol that expresses commitment to action on climate change whether in cafés, bakeries, street corners, balconies and windows, and on clothing. Thirdly, a web application and website that allows people in one of the 57 global locations to march for a person in Paris or France. A website is being established at Marche4us.org. This new tool, the activists say, "will allow all those who can not walk that day, from Beirut to Bamako via Paris, to be represented by all who walk in the Americas, Africa, Asia, in Europe." The application will allow a photo and first name to be uploaded and the person put into contact with someone marching. Pictures and names of those unable to walk due to the state of emergency prohibtion, or in other countries due to local circumstances, can then be carried and displayed by those who will be marching as a symbol of international solidarity. The activists also highlighted that a Peoples Climate Summit on 5th and 6th December in Montreuil will take place and is unaffected by the State of Emergency. Similarly, activities will also occurr from 7th to 11 th December in Le Centquatre, Paris (19th arrondissement), where daily meetings will occurr, as well as debates and activities. A general briefing meeting will be held here in the late afternoon everyday with report back of the negotiations, on general progress of the conference and which countries are blocking negotiations. See Climate Action Zone program. During the climate conference some groups are planning decentralised protests, called 'climate games'. This network of activists have released a statement (en) saying that their protests will go ahead. "We refuse this shadow of the future, we will not bend to the politics of fear that stifle liberties in the name of security. The biggest threat to security, to life in all its forms, is the system that drives the climate disaster. History is never made by those who ask permission." the statement says. The Climate Games statement also acknowledges the changed situation, "We call all teams in Paris to take into account the exceptional circumstances and to not put anyone in fear or danger." For December 12, the day after the climate conference is scheduled to conclude, the activists continued to call for mobilisation on this day, that the state of emergency is also the climate emergency. The press conference by Climat 21 confirmed a mobilisation would take place, but plans are still being actively discussed, debated and prepared. Protesters were originally going to surround the Le Bourget conference centre with red lines to symbolise the lines which have already been crossed to a large degree. French activist groups like Attac continue to denounce the government state of emergency for it's restrictions of freedoms of expression and right to demonstrate. Maxime Coombes, the economist and spokeperson for Attac, an anti-globalization association, wants to declare "the climate emergency". In a statement (fr) released on Thursday Attac urged civil society to take initiatives in defense of democratic freedoms starting with freedom of assembly and demonstration. "The attacks of November 13 obviously justify a heavy police response and a strengthening of security measures as the authors have not all been arrested. This does not justify a national security agenda that denies companies the means to defend themselves against what threatens. These attacks were blind and now they create a strong feeling of insecurity in the population. More reason to peacefully occupy public space, as was done spontaneously during the last days on the terraces, in the public squares." said Attac referring to the vigils for the victims of 13th November. "Regarding COP 21, we know the tragic consequences, including in terms of security, of an uncontained global warming. No army or police squadron will resolve this question here. Only an inventive society, enamored of justice and democracy, will address these issues. Mobilisations for the climate is also our response to the terrorists: you dream of killing and dying, we want social justice and preserving life on this Earth that we share." the statement continued. "At COP 21 we will find together the means to indicate to the world the values ​​of freedom, equality, fraternity between people and with nature. We call for strengthening all decentralized initiatives planned for November 28 and 29, to participate in the Citizen Summit on climate on 5 and 6 December in Montreuil, to enroll in the activities of the Climate Action Zone (CAZ) and finally to prepare and collectively discuss the events of 12 December in Paris." the statement said. Friends of the Earth International (FOE Int) issued a statement (en) on Friday morning urging people planning to travel to Paris for the December 12 protest not to change their plans. "We are exploring creative ways to modify our climate justice mobilizations in order to comply with the new security measures because the final word must be from the people, not politicians or polluters. Our plans for mobilizations in Paris will be modified, but the movement for climate justice will continue to grow with demonstrations, marches, and gatherings planned for 2016 and beyond." said the FOE International statement. Friends of the Earth (Amis de la Terre) are currently organising the Pinocchio climate awards ceremony for the evening of December 3 in an effort to expose some of the worst corporations undermining climate action. At the press conference Eros Sana, the head of 350.org, said, "The red lines around the 2 degrees C global warming are largely met or exceeded and it will stay in motion and after December 12". "We're designing a mass action, which will take place partly outside, taking into account the new security conditions", said Malika Peyrault from Friends of the Earth. "We hope that December 12 is an opportunity for communities affected by climate change and its consequences to express themselves, and we therefore maintain our commitment to organize actions in Paris, which we are currently reviewing the manner in view of circumstances. They shall be under the sign of peace and climate justice. 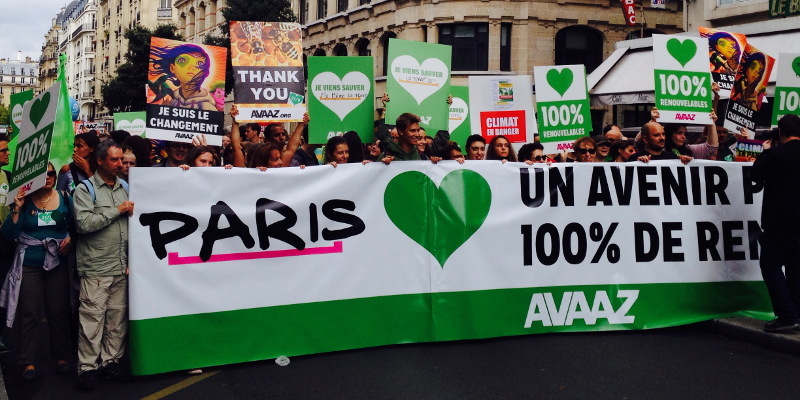 Nothing will prevent us to make our voices heard at the end of the COP21." the Climat21 statement concludes. High profile activists urge "Don't back Down"
Tim DeChristopher, the US civil disobedience activist that went to jail for disrupting a fossil fuel auction, in an opinion article at Ecowatch, calls for activists not to back down in Paris. He highlights the enormous disparity of influence at climate negotiations and the importance of public mobilisations for countering the influence of the fossil fuel industry. "While the fossil fuel industry has direct inside access to the climate negotiations to influence the process, the influence of the climate movement comes from the public demonstration of commitment and resistance. Only the one of those kinds of influence is facing repression. Nearly 400,000 people have been calling for the UN to kick the fossil fuel industry out of the climate talks, but the UN has yet to act. There is no attempt by officials to limit fossil fuel lobbyists out of either security or capacity concerns." DeChristopher argues. "Some of the violence is grindingly slow: rising seas that gradually erase whole nations, and droughts that kill many thousands. Some of the violence is terrifyingly fast: storms with names such as Katrina and Haiyan that steal thousands of lives in a single roiling event. When governments and corporations knowingly fail to act to prevent catastrophic warming, that is an act of violence. It is a violence so large, so global and inflicted against so many temporalities simultaneously (ancient cultures, present lives, future potential) that there is not yet a word capable of containing its monstrousness. And using acts of violence to silence the voices of those who are most vulnerable to climate violence is yet more violence." Klein writes. Just remember the estimated 15,000 French citizens that died in the 2003 extreme heatwave. (Poumadère et al 2005: The 2003 Heat Wave in France: Dangerous Climate Change Here and Now). Climate change in several ways has already been extremely deadly to the people of Paris, and France. Alternatiba, a European climate transitions movement, met today (Saturday) and discussed the state of negotiations at COP21 and posted a media statement (fr). They refused to endorse the Government bans on protests under the state of emergency, and if the COP21 does not guarantee the 2 degree limit, then they argue "it will be a duty, a historic responsibility to demonstrate publicly, on the street, our refusal to endorse this headlong rush towards climate chaos. We have a duty to alert the people around the world that nothing is set and it must instead mobilize more than ever, join and strengthen alternatives to climate change..."
Due to the climate emergency, Alternatiba supports maintaining a protest for Saturday, December 12th in Paris. The network will discuss this through their delegation principles to explore the place and forms of this gathering. They asked that all those planning to come to Paris on December 12 to not change their plans due to the government ban.